Maitresse Erzulie, the Black Madonna of Vodú, the moon and mistress of dreams is dreaming by herself. 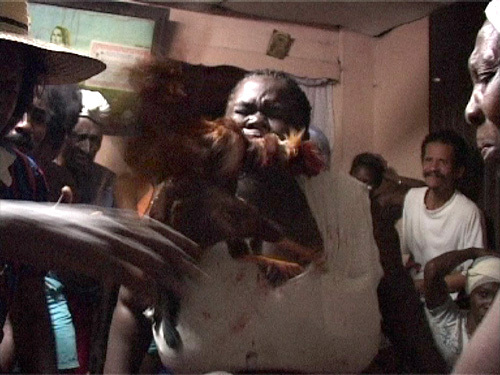 Erzulies Traum (Erzulie’s Dream) is an installation/ performance reconstructing an encounter with the Vodú Community of Santiago de Cuba. The basic raw material of the project is audio and video footage from situations of daily life, Vodú ceremonies and interviews with members of the community, recorded 2003 by blackhole-factory. The installation/ performance combines the documentary material with thoughts on history and ethno-anthropology, personal reports and abstract trance experiments. Erzulies Traum invites people to wander individually through the installation. The footage was produced by blackhole-factory in cooperation with anthropologist Dr. José Millet and a Vodú community from Santiago de Cuba. The members of this community are the descendants of slaves that accompanied the owners of coffee plantations from Haití to Cuba during the 19th century slave uprisings. They brought their newly developed Vodú cult with them. Even after many years of visiting Cuba, working with Cuban artists and scientists and studying afrocuban cults and other phenomena of traditional culture going back to the time of slavery, it was still a challenge to approach the Vodú cult on Cuba, to which so many clichés and prejudices are attached. While originating from Haití, it has developed its own characteristics on Cuba and must be viewed on the background of regional history. 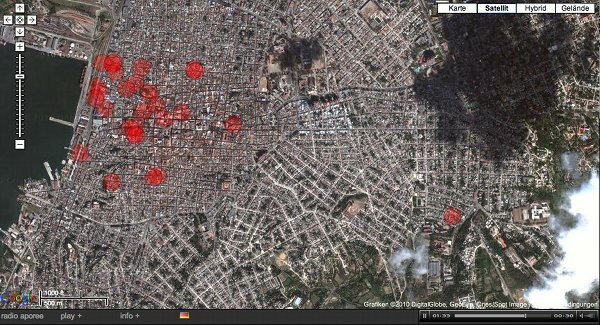 Therefore in “Erzulies Traum“ we are not trying to answer global questions about Vodú, but to explore microhistorical interactions: by meeting individual persons, tracing systems of relationships and reflecting on means of dealing with crises in a city constantly living through so-called special periods, i.e. water and food shortages and other catastrophes. 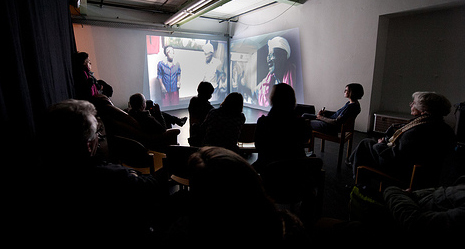 There was a first showing at Kunstmuehle Braunschweig on Dec 17 2010. The whole installation/ performance was first presented from Feb 17 – 19 2011 also at Kunstmuehle Braunschweig. an interactive audio visual installation giving visitors the possibility to remix sounds from every day life in Santiago de Cuba. The soundmap is located at the entrance to give an impression of the city. Click here to go to the radio aporee map. There you can listen to the field recordings we used. a small spot dedicated to the african spirit Babalu Ayé whose aniversary has been celebrated the first night we met the family of the mambó Silvia. With the entrance of the installation Erzulies Traum people get a flower which they can donate and ask for good health. a double screen video installation shows the cycle of arrival, preparation, ceremonies, rituals and chill out. The Binaural Ogunator is a kinetic sound sculpture using silk, computer controlled motors and 2-channel sound system. Two triads of sinusoidal signals are slowly changing frequencies against each other (binaural beats) to create a permanent shift from deep drones to a fast 6/8 rhythm and back. 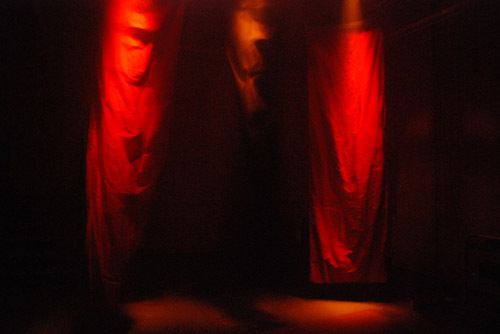 The sound is synchronized with 3 computer controlled motors moving flags of red and black silk. more…. 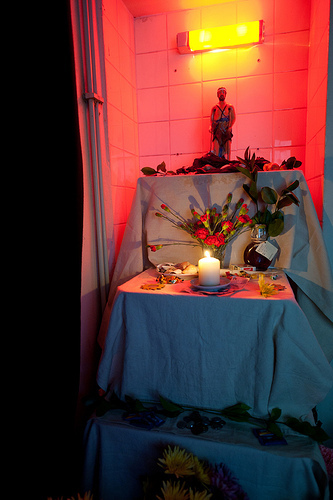 An ongoing performance by Elke Utermöhlen in a small room. The idea is to give a short glance of personal reports about the experience of the vodú ceremonies. Always one of the visitors is allowed to enter the Oracle space and can choose two picture cards of a pack, showing persons who were active during the rituals. A clock gives each one 5 minutes for the consultation. 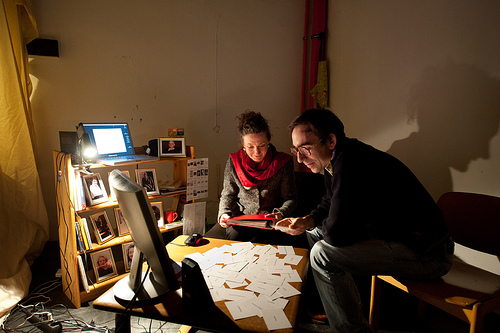 In an improvisation Elke is developing short stories about the pictures, the connection of the two situations and the connection to the visitor. True or not is not recognizable for the audience… While she is talking, Elke shows her visitor short videos fitting to the chosen cards. The clock rings and the visitor has to leave. The “Academy” takes up the visitors’ expectation to have the elements and processes of the installation explained to them. However, instead of explanatory notes the Academy offers a kind of scientific storytelling, where each story will trigger a series of associations around Vodú. To select a subject each visitor may choose among a collection of words printed on small cards. Martina will then deliver a short talk on the concept represented by this word, and scientific texts will be read. The history of the slave trade is one of the topics dealt with, as are unfamiliar phenomena like trance and possession or the relationship between technical media and the spirit world in Africa and Europe. None of these talks are meant to explain Vodú to the visitor, but rather to add material and round off the picture. After a few minutes the lecture will be over, and the visitor will leave and make room for the next guest of the Academy. 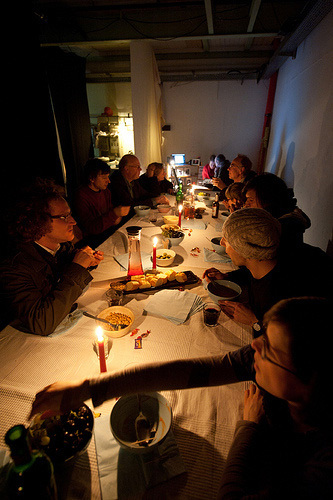 At the end of the performance the visitors gathered round a table for an informal dinner and were served soup, cheese and vine.